The Adaptation CELL gives students the opportunity to investigate how genetic variation within individuals of a species can result in adaptation of the species as a whole to environmental pressures. Through experimentation and data collection, students will address areas such as: do individuals of a species have different traits; the relationship between the survival of the individuals of a species and genetic variations; genetic variations affect on the type of traits or adaptations in the individuals of a species; the relationship between genetic variation and natural selection; how environmental change in the environment affect a population. Realize that individuals of a species are not identical but possess traits that are slightly different. Model genetic variation among individuals of a species. Investigate how genetic variation in a species leads to adaptation of the species to environmental pressures. 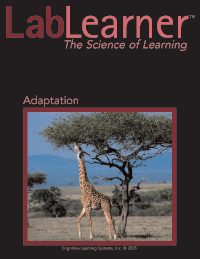 Investigate how environmental pressures determine natural selection. Explore the concept that an organism’s genotype determines its phenotype. Investigate how individuals that possess an advantageous trait will survive but those that do not possess the trait will not. Demonstrate that if individuals of a species do not possess a trait that permits survival, the species will become extinct.